Why Are Random Acts Of Kindness…Random? A few months ago I was at the movie theatre with two extra tickets. I was going to the film with my date so I decided to give the other two tickets away. He stared at me in disbelief while the clerk sighed and grabbed the debit machine away from him to cancel the charge. I explained that I had four tickets and we were only using two so he could have one of the other ones…for free. Why would I give him the ticket? Why would I give anyone the ticket? Why wouldn’t I sell the tickets? Why didn’t I use the tickets later?! I wasn’t sure which “why” he was referring to, but I just laughed, handed him the ticket and told him to enjoy the film. It feels fantastic to give someone something they had no idea was going to happen that day whether it’s a ticket, hug or an unexpected phone call. Why not SHARE our JOY, LOVE and ABUNDANCE with others on a regular basis? Shouldn’t it be called “REGULAR ACTS OF KINDNESS”? Isn’t that the better phrase? Wouldn’t our world run a little smoother if we all did this on a regular basis? I let someone know I am thinking of them by popping a card in the MAIL! I let someone in front of me when I’m driving in traffic. I give someone the parking space I was going to take…it’s okay, there’s always another one! I give someone my time. A half hour of time may completely change their day. 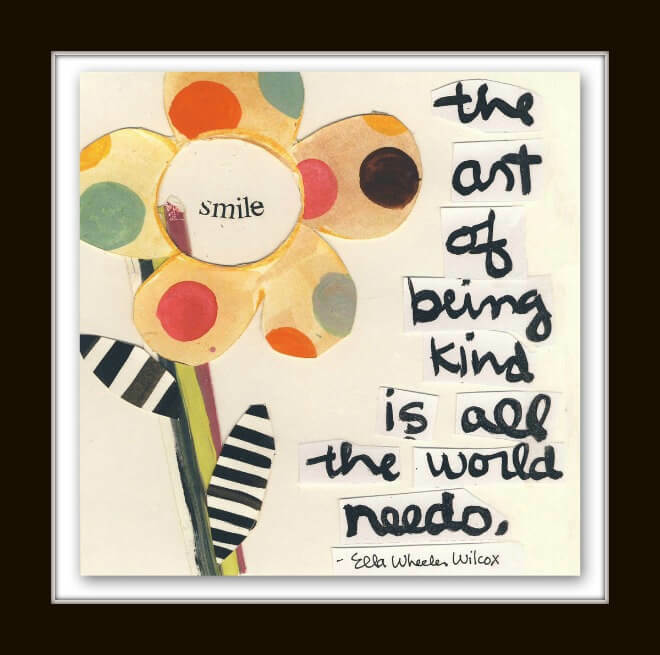 There are many ways to share kindness and it is something we can give freely anytime at any place to anyone! You just don’t know how an act of kindness can affect some else’s day. If you look, there are always ways to extend LOVE and KINDNESS and the true BLESSING of giving to others is the wonderful feeling YOU get by doing a good deed. Extend kindness and love; receive kindness and love. It’s just that simple.